A lot of our new patients come into the office extremely apprehensive. We understand the attitude that most people hold towards dentists, and we make it our goal in life to reverse this preconceived notion! These new patients who come in wary of the office, our tools, and fancy treatments often have not been to a dentist in several years. This means that they have developed tooth ailments and diseases that must be treated with expertise and speed. A large percentage of these types of new clients have a good number of cavities and might require root canals. Having left the teeth without periodic oral examinations for a long period of time has created a build up of bacteria, plaque, and tartar. “What is a root canal and will I need a tooth extraction?”, are words all too commonly spoken by a new patient. The answer to this question is largely dependent on the overall health of the gums and the tooth in question. This makes our job hard because suggesting to a new patient that we will have to perform some kind of affordable dental teeth implants is not a great introductory speech! If a tooth does, in fact, have to be extracted because of long-standing tooth decay, the good news is that there are many procedures that will return the smile to the way it once was. The tooth implants procedure is a cost-effective and permanent solution to replacing a missing tooth. The cost of dental implants is often provided for if you have dental insurance and if no other large procedures have been done within one year’s time,but of course it will depend on both the carrier and the individual dental plan. The way the procedure works is once the tooth is removed, an artificial root is implanted into the gums. While waiting for the jawbone to except this prosthetic root as its own, we will install a temporary dental implant. Once the mouth has accepted the root as its own, we are then able to install the permanent implant. This solution is ideal for those patients who have lost one or just a few whole teeth to trauma or tooth decay. For those patients who have just suffered a broken tooth due to a chip or a crack, an easier and less invasive procedure that is known as a dental crown can be applied. Of course every situation should be assessed on a case-by-case basis. More comprehensive than both crowns and implants are dentures. Affordable dentures are an appliance that is removable, and will generally cover either the upper or the lower sets of teeth. We generally reserve this treatment for those patients who have widespread tooth decay or tooth loss. At the top of the tooth replacement pyramid are veneers, largely a cosmetic treatment, you can read about them on our Cosmetic Dentistry page. 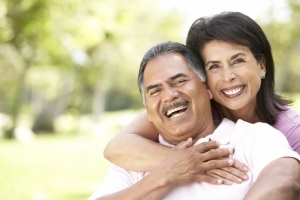 For those looking for a non-removable solution, denture implants are becoming more and more popular. We have installed many of these replacement teeth and are happy to explain the procedure should you be interested. It is important to note that our practice does not only work on our own installations, we are able to update and perform maintenance on those dental works that have been done in the past by other dental offices. Denture repair is one of the things that we help our patients with who have moved out of town, and cannot see their original oral care professional. Many years ago gold teeth were highly popular, but nowadays not so much. We are able to replace implants and swap out older and more outdated implants for the newest most modern materials. If any of these sound like they might be a good option for you, we suggest that you stop by our office for a free consultation and office tour. You can reach out to us on the appointment request form located on the “About Us” Page. Getting your oral health to a healthy level will be our primary goal if it has been quite sometime since her last dental visit. Don’t wait for the issues to build up and for teeth to start falling out!